My perfect day in Amsterdam starts with a tasty breakfast in one of the many cozy cafés in the Jordaan area, which is criss-crossed by canals. Not to mention that riding your bike along the canals in the early hours gives you the chance to enjoy the sights and take good snapshots before the traffic gets the better of the narrow streets. Some of my favorite cafés are Koffiehuis De Hoek (Prinsengracht 341), a typically Dutch café with a cozy feel and Café Winkel, located on the corner of Noordermarkt at no 43. 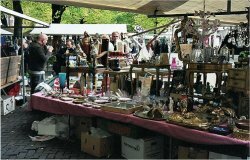 If on a Monday morning, after indulging in a piece of the best apple pie in town at the terrace of Café Winkel, I'll pass by the flea market that is held every week in Noordermarkt. Usually I look for hidden treasures and bargains at the vintage clothing and shoes stalls, but those of you who love antiques will surely come across some interesting finds at the stalls selling china, paintings, bric-a-brac, war memorabilia and antique furniture. If on a Saturday, the square will host in the same place an ecological market with fresh produce. As I'm already in the area, I'll either go to Westerstraat 244 to check the new arrivals at music store Distortion Records (not on Mondays though, as it's closed) or to Van der Linde, the artist supplies shop on Rozengracht 36-38. 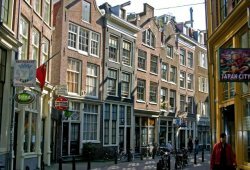 I'll then cross the charming canals of Jordaan and head to Haarlemmerstraat, one of my favorite shopping streets in Amsterdam. Although it is packed full of unique shops, restaurants and boutiques, I'll head straight to Unlimited Delicious (Haarlemmerstraat 122) and buy some provisions of handmade chocolate. For lunch, if I'm alone I'll go the Eetcafe Harlem Soul Food (Haarlemmerstraat 77) and look for a nice table in the sun. This café has a relaxed atmosphere and the menu is changed daily. Plus, their terrace makes for a nice place for people watching. If I meet friends, lunch at Café Van Zuylen at Torensteeg 4-8 is part of a longstanding tradition. Wandering about and looking for inspiration through the many designer boutiques, vintage clothes shops and gift shops in the vibrant nine streets (De Negen Straatjes) area tops my list of favorite things to do in Amsterdam. Next, on my way to Concerto, another great music store located at Utrechtsestraat 52-60, I'll get some nice flowers from the Bloemenmarkt, Amsterdam's floating flower market. If in need of some quiet moments, I'll bike towards the harbor, where I like to meet friends for a coffee in an unexpected location: the roof terrace of Amsterdam's Public Library (Openbare Bibliotheek). It offers an astonishing view over the port and Amsterdam's skyline. For dinner we'll head towards Amsterdam's Chinatown and pick one of the restaurants along the Zeedijk. Amsterdam is a great place to find international restaurants as nearly every national cuisine is represented here! From there, the evening can continue in many ways as there are still many things to do in Amsterdam. If in a chatty mood we'll go to Amsterdam's brewery, Brouwerij 't IJ at Funenkade 7, which is hosted by the highest wooden windmill in the Netherlands, De Gooyer. If on a Friday, a late visit at the Van Gogh Museum (open until 10pm) can be a great way to finish the day. The special evening program at the Van Gogh Museum features lectures, performances and live music events. However, Friday night is also the perfect time to hit the clubs. Studio 80 in Rembrandtplein scores high on the list of good music and energetic atmosphere, followed by world famous concert clubs Paradiso (Weteringschans 6-8) and Melkweg (Lijnbaansgracht 234a). Here, too, days have only 24 hours so I'll stop here but it might be clear to you by now that Amsterdam, despite being a small capital, pretty much has it all. Also find out about Amsterdam Advisor authors Arjen's and Declan's favorite things to do in Amsterdam.